Eric Malling was born in Swift Current, Saskatchewan, on September 4, 1946. He attended the University of Saskatchewan, receiving his Bachelor of Arts in English Literature, and went on to the School of Journalism at Carleton University. After graduation, he worked for the Swift Current Sun and the Regina Leader-Post. In 1968 he began work for the Toronto Star and in 1974, he started doing interviews on Canada AM for CTV. Malling joined CBCs The Fifth Estate in 1976, hosting it for 14 years. 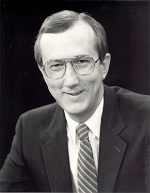 In 1990 he joined W5 at CTV. This program was renamed W5 With Eric Malling. Malling won one Gemini Award and six ACTRA awards. He is the only person to have won the Gordon Sinclair Award for excellence in broadcast journalism three times. Eric Malling died of a cerebral hemorrhage in Toronto on September 28, 1998.